That promise is now Susan G. Komen for the Cure®, the global leader of the breast cancer movement, having invested more than $1.9 billion since inception in 1982. Thanks to events like the Susan G. Komen Race for the Cure® and the Susan G. Komen 3-Day for the Cure®, and generous contributions from partners, sponsors and fellow supporters, Komen’s has become the largest source of nonprofit funds dedicated to the fight against breast cancer in the world. Komen Greater NYC was founded in 1990 by friends of the late television journalist Benita Feurey — friends committed to keeping her memory alive by providing breast health education, screening, treatment, and other services to individuals in the five boroughs of New York City, on Long Island, and in Westchester and Rockland Counties. 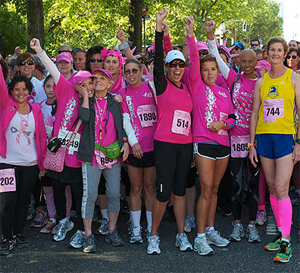 Since its inception, Komen Greater NYC has raised over $50 million. Seventy-five percent of net monies raised supports local breast health education, screening and treatment programs; twenty-five percent goes to national peer-reviewed research to find the cures. 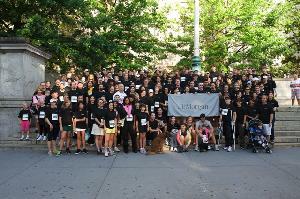 In 2010, Komen Greater NYC awarded a record-breaking $4.3 million in grants. Over $2.8 million supported 37 community-based organizations that provide breast health programs to underserved women. Three area hospitals received a total of $242,493 to increase the capacity of local researchers to enroll women in breast cancer trials. $40,000 in grants were made available for local breast cancer conferences and education programs. Finally, Komen Greater NYC provided over $1.2 million for national peer-reviewed research programs. Blythe Masters is Board Chair for Komen’s NYC. She is currently the Head of Global Commodities of J.P. Morgan’s Investment Bank, where she has worked since 1991. She is also a member of the JPMorgan Chase Executive Committee. Previously, Blythe was Chief Financial Officer and prior to that, Head of Global Credit Portfolio and Credit Policy and Strategy. She recently served as Chair of the Securities Industry and Financial Markets Association (SIFMA). Blythe has spearheaded JPMorgan Chase’s strong intercompany efforts for the Komen New York City Race for the Cure and has herself been the top fundraiser for the Race every year since 2006. Visit the national Komen for the Cure website. Visit Komen’s Greater New York City affiliate website.